Some questions from our clients and our readers seem to come up more often than others. 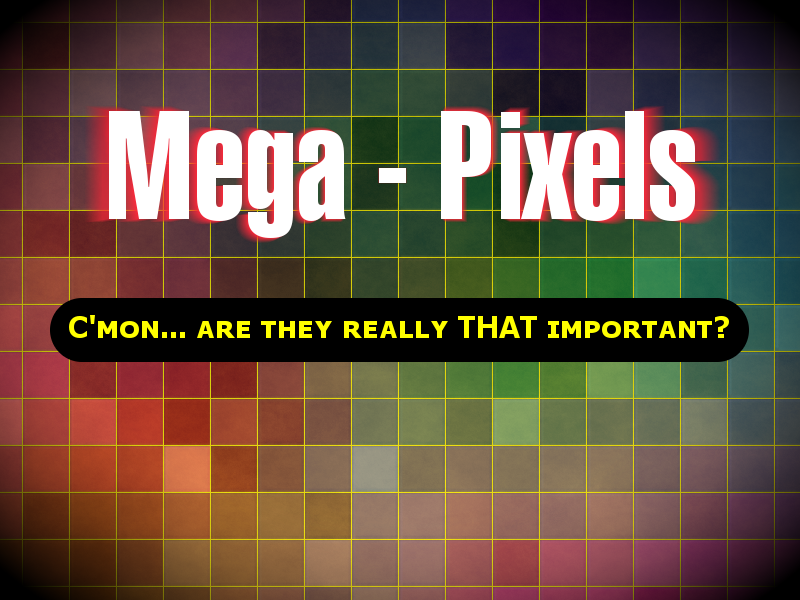 Many of those questions center around the importance of Mega-pixels. This question came across my desk this morning and since it’s often relevant to our readers, I am sharing my response with you. The good news is that you are asking the good questions. The flip-side is that this is opening a door to a warehouse full of more questions. Yes, megapixels are an important factor to the end result. It is only one factor however. Megapixels are top of mind for everyone because the camera manufacturers need “features” they can market with. They are looking for ways to set their product apart from the others, and this stat is one that is easily digestible to the consumer. We tend to like easy comparisons, and anything with a number fits that bill nicely. Unfortunately, the marketers rarely tell you the benefits of the various features and leave it up to you to infer them. There are other considerations that are often driven by an individuals needs. Since your question was in regards to image quality in relation to enlargement, I’ll focus comments there. All of the items are important to quality, but items in bold are specific to how big the image will reasonably print before the quality drops to unacceptable. While pixel count is certainly important, equally, if not more important is lens quality. Pixels are not a representation of sharpness, but of resolution. While the two are inter-twined, sharpness is in my opinion a bigger factor. We have printed many files that had low pixel count but were shot with really nice lenses. The results are better than a high pixel count file shot with inferior lenses. A not so good 24MP file will not print as well as a good sharp high quality file from an 18MP file scaled up to 24MP If your budget demands picking either good glass or high mega-pixels, I would suggest you go with the better glass – you’ll get a better return on your investment. Stats and specs can be misleading, so use them as general guide, not as gospel and remember, more is not always better. Especially if you are giving up something more important to get the “more”. Noise level varies from model to model and is a result of the quality of the chip, the amount of light falling on the chip and the quality of the camera’s internal computer and it’s software. It can also come from the software you use on your computer to process your RAW files. Part of the cost of a pro-level camera is to pay for the high-end and high-speed processors and CCD chips used in the body. Most in-camera file compression is destructive and at varying degrees. In my opinion, JPEG is not the ideal file format if detail in the print is of paramount consideration. The compresson process throws away critical detail and is very damaging to the color fidelity. If you pay for a 24MP camera and shoot jpeg, you may only get 12-18MP worth of real detail and around 6MP of color fidelity. You can learn more about RAW versus JPEG in a previous post here. With list in hand, the internet or a good camera store should be your next destination for finding models that fit your needs. Nothing beats a well informed and experienced camera sales-person. If you have your list, they can often point you to a few selections in a matter of minutes. It might cost a small amount extra to buy in the store, but the time and frustrations you save instead of doing the search yourself can be worth it. In the comments below, share what your priorities are and your methods for picking the ideal camera or other tools in your arsenal. I’ll send the first five helpful responders a nice gift.